When gathering information about our DeWalt DWE7491RS table saw review, we found the unit far exceeded our expectations on providing quality precision cuts. The 10-inch table saw is ideal for transport challenging job sites with a sturdy stand and easy-to-navigate wheels. 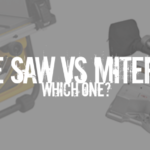 Our DeWalt DWE7491RS Table saw review uses the same factors in determining the quality of this specific unit compared to all of its competitors. It meets and exceeds our minimum standards of an affordable, quality portable table saw. Rack & Pinion Telescopic Fence System – The saw makes adjusting the fence smooth and quick, while still providing accurate cuts. 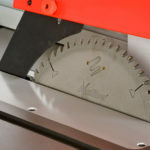 Increased Rip Capacity – The 32″ inch rip capacity provides easier cutting for trim materials and large shelving boards. Attached Storage System – The storage system is attached to the unit, providing easy access to the riving knife, wrenches, miter gauge, fence, Blade Guard Assembly, cord wrap, and push stick. Sturdy Rolling Stand – With a quality design, DeWalt has manufactured a rolling stand that provides excellent stability and durability, during set up and break down. Telescopic Fence Rails – Its heavy-duty telescopic fence rails make it easy to retract the system to break it down to a portable, small unit. Flip-Able Ripping Fence – With the ability to flip over the DeWalt table saw ripping fence, the user can produce narrow rip cuts with accuracy and ease. Heavy-Duty Motor – The DWE7491RS houses a 15-amp motor that strong enough to quickly rip through a variety of hardwoods with accuracy and ease. The blade cuts to a depth of 3-1/8 inch when set at 90 degrees, and 2″ inches when the blade is set at 45 degrees. A rack and pinion fence is an essential component to a high quality portable table saw. This is because it eliminates inaccuracies when cutting, by providing a solid fence that can lock firmly into place. With just one hand, it is easy to unlock the fence and spin it around to adjust it accurately. Once the fence is set into place, a simple flip of the lock is all it takes before turning on the saw. The firm lock prevents moving or twisting, which is a common problem associated with lower quality portable table saws. When making smooth and consistent cuts, a powerful motor is essential. DeWalt comes through by providing adequate power and then some, with a 15-amp motor, specifically designed for easy ripping through a variety of hardwoods. Its dust collecting port easily connects to a dust extraction system or the shop vacuum, making workplace cleanup a breeze. 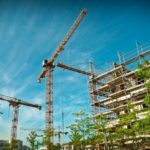 While there is a huge assortment of powerful saws available to craftsmen, professionals or do-it-yourself homeowner, portability is crucial when moving the unit to the job site. With a sturdy design, durable legs, and easy setup and breakdown, the DeWalt unit makes it easy to avoid dangerous cuts while providing better accuracy. 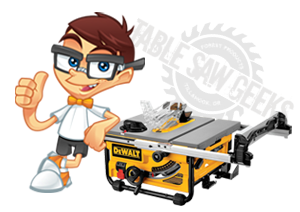 Our DeWalt DWE7491RS Table saw review finds that the unit far exceeds our expectations when comparing it against all available table saws in its price range. The clever storage solutions, powerful motor, high-quality rip fence and sturdy rolling stand make the unit an ideal choice for anyone seeking a high quality portable table saw, at an affordable price.